How to blog your way into a new career using these 5 key Questions - New Year, New Career Series. HomeNew Year New Career SeriesHow to blog your way into a new career using these 5 key Questions - New Year, New Career Series. A new year is upon us, with it comes the need for self-improvement, self-actualization, and heck, even the self-belief that you can do anything you set your mind to - and rightly so, because you can! Now this, for many of you out there, could mean finally pursuing your dream to launch a new business, new skill, or perhaps all you want is to blog your way into a new career and finally have that proper job you've always wanted to have but lacked the necessary qualifications to do so! But if for some reason you're holding back and are not sure if blogging is the right way to help launch your new career, especially since the blogging market has been around for so long and are wondering if you're too late to start a new blog in 2019, then how about you go and read our previous article that answers the question of whether or not 2019 is the right time to launch and become a blogger HERE! Now, did you read it? Are you satisfied? So... back to the matter at hand - and that is: "how can you successfully launch a new career through blogging in 2019?!" There are many things that you could do, like choose a blogging platform, decide on your blog name, choose the topics you want to cover , etc, but that's not the number 1 thing you should do.
" What do I want to do?" First decide on what it is exactly you want to pursue before you go any further and start asking if WordPress is better than Blogspot as a hosting platform! FYI, it's not - especially if you're new to blogging and may not be familiar with technology- WordPress is too labour intensive to set up due to its many components whereas Blogspot Blogger is so simple and user friendly to set up. But more on that for later! For now, just ascertain what it is that you'd like to see yourself doing and achieving for 2019. What would you like your new career to be? "For me, it is helping go-getters like yourself build and grow a successful business online in the best way they can!" So sit down and really think about what it is you want to do and right that down - in detail! Knowing your strengths is important as it'll help guide you to making the right decisions regarding which career path to launch because there's a reason why you're good at what you're good at! You didn't just become fantastic at editing scripts, designing your home, or even building a good following on social media. All of these things that come easy to you and that you're good at are meant to be clues regarding what it is you should or could do. "What will it take for me to launch this?" Research the areas you want to pursue and find out exactly what it is you need to succeed in that area? Will you need to take extra lessons, acquire new skills, dedicate more time towards achieving your goals, etc. Also, will it take extra financial input to purchase a website domain for my blog, blog theme, paying for my business logo design, etc. And if so, how much are you willing to spend towards this? "What Am I qualified to do and can I use my previous qualifications towards launching a new career?" This feeds into question number 3 above. So do an inventory of your skills versus the required skills necessary to archive that new career you hope to start by launching your blog and extract or take note of any of your previous skills that can be used as transferrable skills in helping you become what it is you want to be in 2019. "Based on my current skills, natural talents and even previous qualifications, what topic can I choose to base my blog upon in order to launch a new career?" Ok, so this is a loaded question, so let's say you have a degree in Graphic Design but you never really became a Graphic Designer after college, and instead you've worked in retail for the last 7 years as a sales assistant, and you love to engage with like minded people on social media and because of it you've garnered a huge following on Facebook and Instagram and your dream in 2019 is to finally ditch that Retail Sales Assistant Job and pursue a career as a Social Media Manager either for a company or launch it as a your new business?! Then in that case, based on your skills and past experiences, you clearly have some/if not most of necessary skills to launch a new career as a Social Media Manager plus your Graphic Design Degree is an added value in helping to set you apart as a professional plus it's an added skill that you can used to design all the marketing collateral for Social Media. Which means, in order for you to land a new job or start a legit career as a Social Media Manager all that you need is EXPERIENCE of having worked as a Social Media Consultant and this is where launching a blog comes in as it'll help you build the necessary experience needed to help launch your new Digital Marketing Consultancy career plus it'll be a good platform to create a solid list of clients if you wish to work for yourself. If you need more help to see if your skills and past experiences can be used towards launching your new career? "How will blogging about this topic either help land me a new job or help launch a new career for me?" This is a crucial step and an important question that needs answering because without knowing the answer to this question, you risk future failure and wasting your time and resources. it'll help you to successfully rebrand yourself from what you were previously known for into what you wat to be known as. 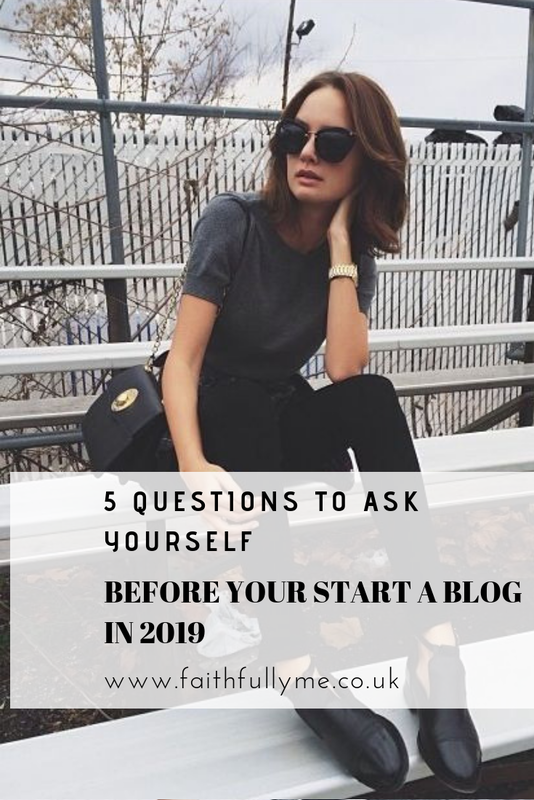 So those are the questions you need to ask yourself if your goal for 2019 is to blog your way to a new career and finally have that proper career! The next installment of the "New Year, New Career Series" is out next week!